Clearly, the detailing of the reinforced concrete members is the key to good design and execution of work at the site.That is why poor detailing of reinforcement makes the structure undergo cracking, excessive deflection, or even collapse. Reinforcements resist tensile forces. They may also be required in the compression zones to increase the compression capacity, enhance ductility, to reduce long-term deflections, or increase the flexural capacity for beams. Added to that, they prevent cracking of concrete due to shrinkage and temperature stresses. 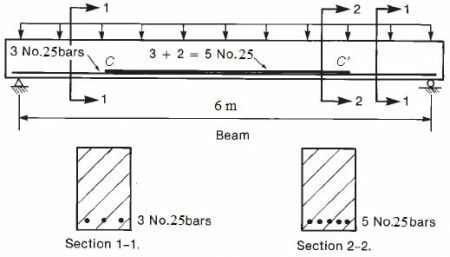 Finally, different aspects of reinforced concrete beam detailing based on ACI Code is explained in the following sections. Stirrups with different spacing-tackle vertical and diagonal shear. The function of hooked anchors is the provision of additional anchorage when there is inadequate straight length available to develop a bar. Commonly, standard hooks described in ACI Code Section 7.1 utilized apart from the case where it is specifically specified. 180-degree bend plus 4db extension, but not less than 65 mm at free end of bar. 90-degree bend plus 12db extension at free end of bar. 16 bar and smaller, 90-degree bend plus 6db extension at free end of bar. 25 bar and smaller, 135-degree bend plus 6db extension at free end of bar. 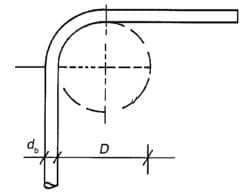 Standard bends in reinforcing bars are described in terms of the inside diameter of bend because this is easier to measure than the radius of bend. The primary factors which control the minimum bend diameter are feasibility of bending without breakage and avoidance of crushing the concrete inside the bend. 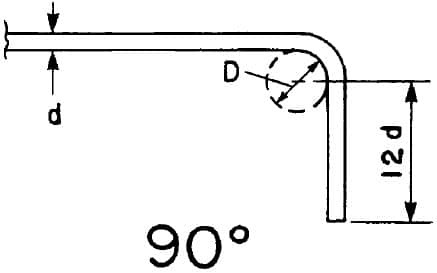 Diameter of bend measured on the inside of the bar, other than for stirrups in sizes No. 10 through No. 16, shall not be less than the values in Table 1. Inside diameter of bend for stirrups shall not be less than 4db for No. 16 bar and smaller. For bars larger than No. 16, diameter of bend shall be in accordance with Table 1. Inside diameter of bend in welded wire reinforcement for stirrups shall not be less than 4db for deformed wire larger than MD40 and 2db for all other wires. Bends with inside diameter of less than 8db shall not be less than 4db from nearest welded intersection. 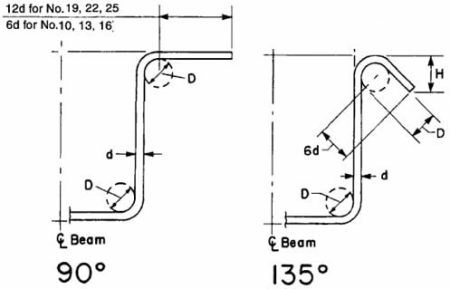 In beam detailing, the detailer or designer shall provide sizes, spacing, location, and types of all stirrups which include open and closed stirrups. stirrups may be vertical or inclined. Moreover, where the design requires closed stirrup for shear, the closure may consist of overlapped, standard 90o end hooks of one or two-piece stirrups, or properly spliced pairs of U-stirrups. Furthermore, when the design requires closed ties for torsion, the closure may consist of overlapped, standard 135o hooks of one- or two-piece ties enclosing a longitudinal bar. Lastly, there are different techniques for anchorage of stirrups, but the most common is to use one of the standard hooks as shown in figure 3 and figure 4. Use the following expression to calculate development length in tension, but no less than 30.48cm. Ktr: factor which denotes the contribution of confining reinforcement across potential splitting planes. : the traditional reinforcement location factor to reflect the adverse effects of the top reinforcement casting position. : reinforcement size factor that reflects the more favorable performance of smaller diameter reinforcement. : factor reflecting the lower tensile strength of lightweight concrete and the resulting reduction of the splitting resistance, which increases the development length in lightweight concrete. (cb+ Ktr)/db equal to 2.5 if the result of (cb + Ktr)/db is less than 2.5. 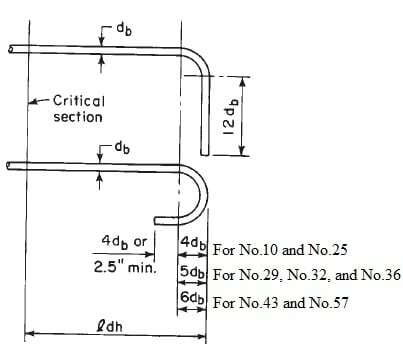 Atr: total cross-sectional area of all transverse reinforcement within the spacing s.
development length can be calculated using the greatest of the following formula, but it shall not be smaller than 20.32cm. Individual bar development length within a bundle, in tension or compression, shall be that for the individual bar, increased 20 percent for three-bar bundle, and 33 percent for four-bar bundle. = 1.3 for lightweight aggregate concrete. Commonly, reinforcements are provided close to the bottom of beams so as to counter act tensile forces on the beam. Moreover, these reinforcements computed based on maximum moments at mid spans and at face of supports. these moments reduce in beam regions other than mid span and support faces. Therefore, it is possible to cut off bars in zones where they are no longer required. hence, cut off bars provide economic advantages. However, bar cut off shall be kept as minimum as possible to decline design and construction complexities. Furthermore, it is important to extend the cut off bars beyond cut off point by development length (ld) to ensure adequate bond between bar and concrete. Development length will be discussed in the section below. Lastly, the location of points where bars are no longer needed is a function of the flexural tensions that results from the bending moments and the effects of shear on these tensile forces. In beams, development length is provided at points of critical stress. 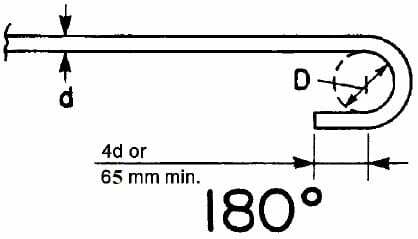 The critical stress points in beams are Points of maximum positive and negative moments are critical sections, from which adequate anchorage ld must be provided. 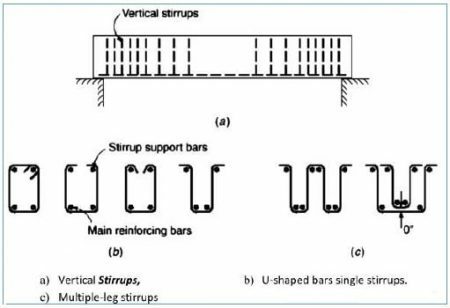 Moreover, critical points are also at points within the span where adjacent reinforcement cut off; continuing bars must have adequate anchorage ld from the theoretical cut-off points of terminated bars. Added to that, cut off bars shall extend beyond the theoretical cut-off points to resist flexure for a distance equal to d or 12db. For simple members, minimum one-third of positive moment reinforcement and one-fourth of positive moment reinforcement in continuous members must extend along the element face into the support. 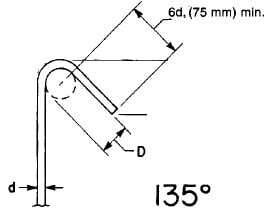 These reinforcements in beams shall extend into the support at least 152.3mm. Negative moment reinforcement in a continuous, restrained, or cantilever member, or in any member of a rigid frame, shall be anchored in or through the supporting member by embedment length, hooks, or mechanical anchorage. Additionally, at least one-third the total tension reinforcement provided for negative moment at a support shall have an embedment length beyond the point of inflection not less than d, 12db, or clear span /16, whichever is greater.